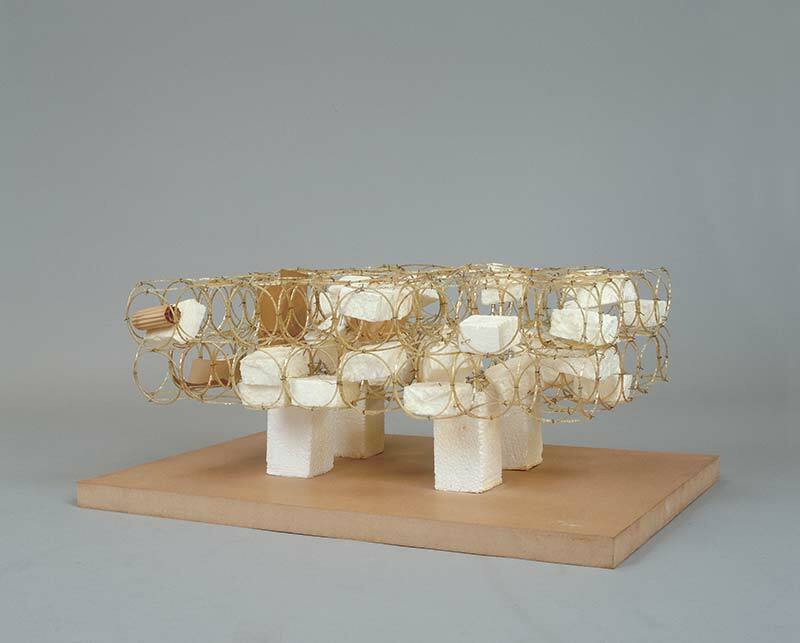 A principle Yona Friedman imagined as early as 1959, Spatial City is a spatial structure raised on stilts that can straddle areas where construction is not possible or even existing cities. “This technique allows for a new type of urban development, i.e. the one of the three-dimensional city. The idea is to increase the original surface area of the city by means of raised planes” (Friedman). The superposition of these levels makes it possible to assemble an industrial city, a residential city and a commercial city on the same site. Buildings must “touch the ground with a minimum surface area; be collapsible and movable; be transformable at will by the inhabitant.” Thus, Spatial City constitutes what Yona Friedman called an “artificial topography”: a framework suspended in space that outlines a new mapping of the territory by means of a homogeneous, continuous and indeterminate network. Within this megastructure, this modular fabric offers a city the perspective of unlimited growth. Individual dwellings are grafted onto the open grid, which leave it only half occupied, the “fillers” having to alternate with “voids”; thereby giving a variable rhythm to the whole, depending on the choices of the inhabitants. “The power of individual expression will thus become a random composition (...) and the city will again become what it always was: a theater of daily life” (Friedman). Published in France by Michel Ragon in the early 1960s, Spatial City still nurtures the imaginations of many contemporary artists and architects as well as cutting-edge research in the field of modular architecture.